I'm up visiting my daughter for the week in Northern California. On Monday, we went into "the city" for the day. (In northern California, San Francisco is "the city.") The weather was perfect! 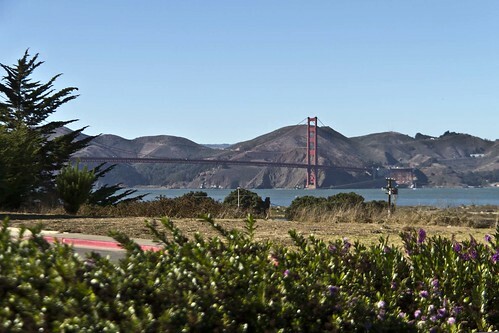 I found a fun view of the Golden Gate Bridge from the Presidio. As I waited to see a huge cruise ship pass under the bridge, I noticed this Oracle catamaran, which looked absolutely gigantic in the bay. I never realized until I watched the news today that this "Oracle" was a multi-million dollar 72-foot contender for the next America's cup—two years from now. 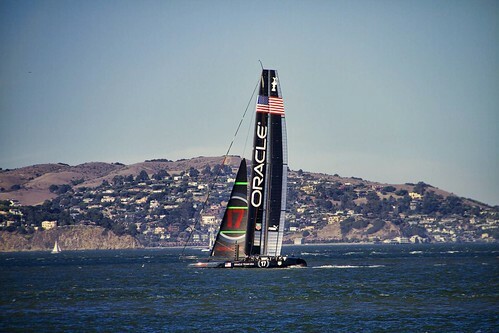 (Oracle, the sponsor, is also the current America's cup holder.) Unfortunately, while on a test run today, in choppy seas, the catamaran capsized on the Bay! No one was injured, but the 131-foot-tall rigid wind sail was damaged pretty badly. It took hours before they got the craft back to the pier. I love the perspective on the Golden Gate Bridge. Beautiful.